Wall Street says you have to settle for the pathetic 2% yields most folks scrape by on from 10-year Treasuries, or your typical S&P 500 stock. Because there’s a far better way to bankroll your retirement that they won’t tell you about: municipal bonds. While their name sounds boring, that’s the last word I’d use to describe the income they throw off: “munis” pay dividend yields of 5% and often much more, thanks to a unique tax advantage. In fact, the 3 off-the-radar plays I’ll show you below can let you pull a steady (and safe) 6.5% out of some of the safest muni bonds out there. Municipal bonds’ income gets a big boost from a surprising source: the IRS. That’s because the income they hand you is almost always federal-tax free and, in most cases, free of state taxes, too. Let’s imagine a muni bond yielding 5%. If you’re in the 28% federal tax bracket, you’d need a 6.94% yield on corporate bonds or dividend stocks to get the same after-tax income our muni bond pays. There’s a second, knock-on bonus here: you can buy and hold municipal bonds without worrying about the extra income bumping you up into a new tax bracket. These are just a couple perks of investing in municipal bonds. Now let’s look at the best way to tap them for outsized payouts with far more stability than you get from your typical dividend stock. Let’s imagine the State of Ohio wants to spend $5 billion overhauling bridges. To raise that cash, Ohio would release $5 billion worth of municipal bonds to the public. Investors can buy any amount of those municipal bonds, and Ohio will pay the coupon rate (i.e., interest payments) to investors at regular intervals as specified by the bond. Municipal bonds take many forms. Since they’re debts from states, cities, counties and government-connected municipalities (such as hospitals), they’re very often government guaranteed. That is, the state promises to pay the bond back in full at the end of the bond’s term (the length of which is called the bond’s duration). While some munis are backed by the full faith and credit of the government, some are “revenue-backed,” which means they’re tied to the success of the project they’re funding. But you shouldn’t lay awake at night worrying about these funds, because municipal bond default rates have been below 0.03% over the last decade! And don’t let the word “default” spook you, either, because as I’ll show you in a moment, there’s a simple way you can protect yourself almost 100%. Let’s take a look at the latest high-profile example, Puerto Rico, which defaulted in 2015. One analyst says investors may end up getting just 75% to 80% of the cash they initially invested. Obviously, this is horrible if you invested a large chunk of cash just in Puerto Rico, but the truth is, very few people would do this. Bond funds come in three main classes: mutual funds, ETFs, and closed-end funds (CEFs). Your typical fund will have over 100 municipal bonds in its portfolio. So if you invested, say, $100,000 in a fund that had one Puerto Rican bond and 99 other bonds, you may lose 25% of 1% of your initial investment—or around $25. There are a couple other good reasons to love muni-bond funds, too. For one, municipal bonds aren’t like stocks, which are sold electronically all the time, in milliseconds. Many rarely trade; it’s not uncommon for a municipal bond to not be bought or sold for six months or more. Second, a muni bond’s shelf life is a lot shorter than that of a stock. Apple (AAPL) shares have been around for decades and aren’t going away anytime soon; the typical municipal bond is redeemed (i.e., the principal is given back to investors and the bond is retired) after six years or so. For that reason, muni investors tend to rely on IPOs a lot more than stock investors do. But muni bonds aren’t just released to anyone. Bond brokers and underwriters offer the best bonds to their biggest clients—or keep them for themselves. That means regular investors are often left with the scraps. Municipal bond funds, however, are the brokers’ biggest clients, and that bumps them way up the list when it comes to getting in on the best-quality bonds. Interest rates are a big concern with municipal bonds because of something known as convexity. We don’t have to get into details here—it’s just a fancy word to describe the relationship between changes in interest rates and a bond’s value. The higher the convexity, the more a bond will go down when rates rise. 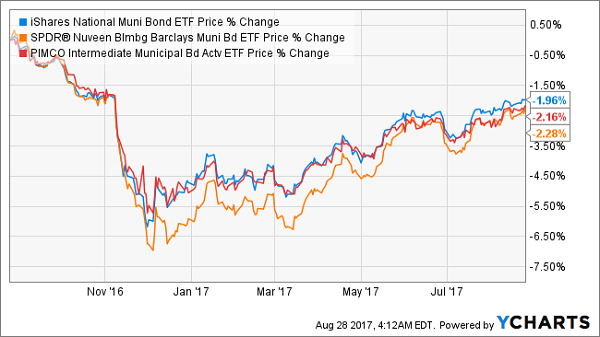 The iShares National Municipal Bond ETF (MUB), SPDR Nuveen Bloomberg Barclays Municipal Bond ETF (TFI) and the PIMCO Intermediate Municipal Bond Active ETF (MUNI) all plummeted late last year but have slowly been recovering. Why? Because the market has realized it overreacted. But the dividends these funds provide are still only around 2.3%, though that doesn’t include their tax advantages. 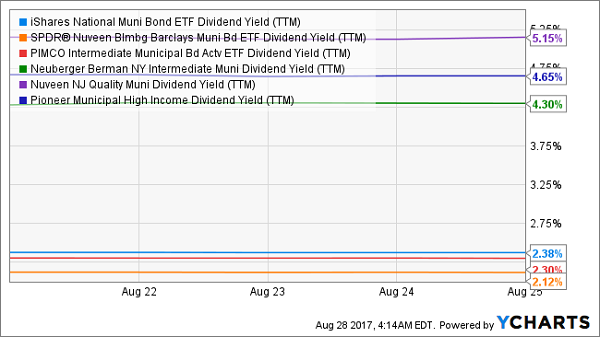 The 2.3% yields on the three funds I just mentioned are typical for municipal-bond ETFs, which is why we’re going to bypass ETFs and go straight to their actively managed cousins, municipal-bond CEFs, or closed-end funds, which boast some of the highest yields available on the market today. Their higher yields are also competitive with many riskier investments when you consider taxes; the tax-equivalent yield of these three funds for someone in the 28% tax bracket would be about 6.5%—and that’s not even taking municipal bonds’ state tax exemptions into account. I’ve just released a FREE Special Report that reveals 4 more CEFs you can count on for MASSIVE growth and high—and growing—dividends in the years ahead. If you want to build a portfolio that can keep your retirement income safe—and growing—you need to hold at least a couple of these 4 stout cash machines. BIG cash payouts: My 4 favorite CEFs boast 7.4% dividend yields, on average—4 TIMES MORE than your typical S&P 500 stock! AND I’m expecting strong dividend growth here, too, so you’ll be pocketing 10% or more in short order. They’re on sale … for now: All 4 of these low-key funds trade at ridiculous discounts to their true value. But that won’t last. When these weird markdowns snap shut, they’ll catapult us to 20%+ price gains! Add it all up and you’re looking at a nearly 30% total return in the next 12 months here, with a big chunk of that in CASH. I’ve put everything you need to know about these 4 stealth funds in my NEW special report—which is waiting for you now. Don’t wait. Go right here and I’ll share the names, tickers, buy-up-to prices and my complete research on all 4 of these retirement lifesavers.